and learn from you, how to do it better. Our Faculty is carefully selected based upon their customer service, safety, and instructional skills. The passion for teaching and the consistent commitment to both self and student improvement are the traits we seek and cultivate in our Staff. We have many volunteer and guest instructors that teach specific courses here with ADAPT, if you are interested in joining our team or acting as an Associate, to bring a course of instruction to your school, facility, or community please contact us and let us know how we can work together. Eric began his professional career before even graduating from high school, working security at local clubs and performance venues in the Las Vegas area. With a background in Martial Arts he was soon adopted into a security and executive protection agency and began training in defensive tactics and firearms. 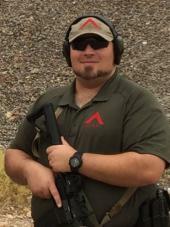 Training with Law Enforcement, Military, Private Security, and Firearms Instruction schools he found his passion for teaching and progressed to being one of the youngest Senior Range Masters at Front Sight Firearms Training Institute for several years. Training thousands upon thousands of students, Eric left Front Sight with incredible experience in working with individuals from every walk of life. In addition to continuing to actively work in the security field he continues to study, train and educate others wishing to be security professionals, firearms instructors, or defend themselves and their loved ones. Read more here. As a Former Senior Range Master at Front Sight Firearms Training Institute who was honored to be involved with the Instrutor Development training program, we hold the same standards now with ADAPT.